Just sit back, relax and enjoy the ride! Depending on the availability Sachin will personally lead your Rickshaw Tour. All the time we have our ‘city explorers’ to accompany you along with rider. 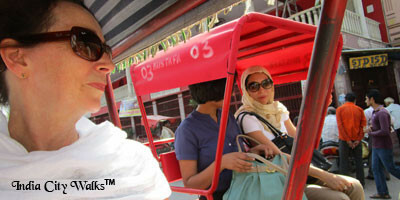 For groups larger than two people there will be a mix of rickshaws. Our city explorers will not only show you the city, but will also be your personal photographer and concierge to make sure you are comfortable and enjoy the tour at your own pace. Our itineraries vary as each tour is private and tailored to what you would like to see and experience. We will help you design the perfect tour for you and your group. 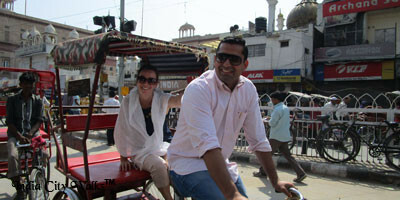 Rickshaw Tours is the perfect way to see the city in an adventurous way! It is our passion to deliver a truly memorable experience and at the same time keep you as safe as possible. 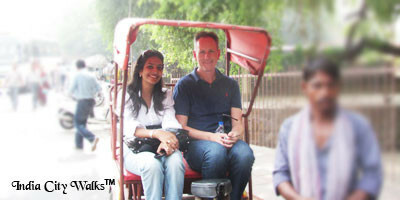 We are expert in city tours and local experiences. 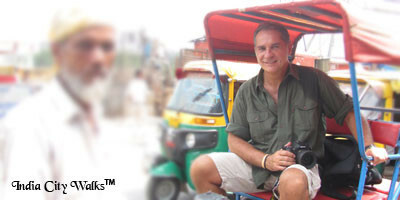 We started as “Delhi Walks” and offer walking tours alongside city sightseeing. We have earned a solid reputation for our passion, enthusiasm and importantly, our sense of showcasing the character of the city. We operate under the umbrella brand INDIA CITY WALKS and always aim to exceed customer expectations. Widely recognized for our commitment to unsurpassed guest service, we can cover all the logistics of planning your trip. We’d love to have you for city tours, sightseeing and walks. For more details you can reach us through email during weekends and holidays. Write a review, post a photo or upload a video using the icons below.